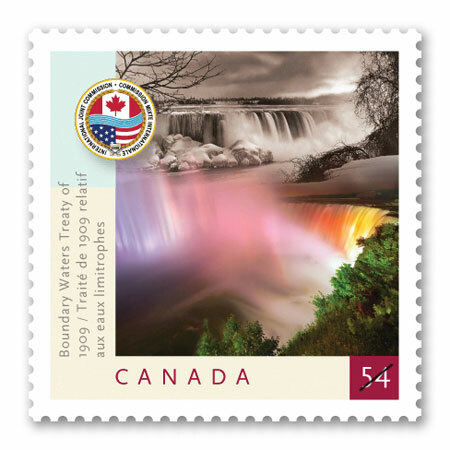 On June 12th, 2009, Canada Post began issuing a stamp commemorating the 100th anniversary of the signing of the Boundary Waters Treaty between Canada and the United States. This treaty, negotiated by George C. Gibbons and signed in 1909, regulates issues regarding the use of the waterways along the boundary of the two nations. The only things it fails to regulate against are pollution and the damming or diversion of the waters. This beautiful stamp features images of Niagara Falls, past and present.